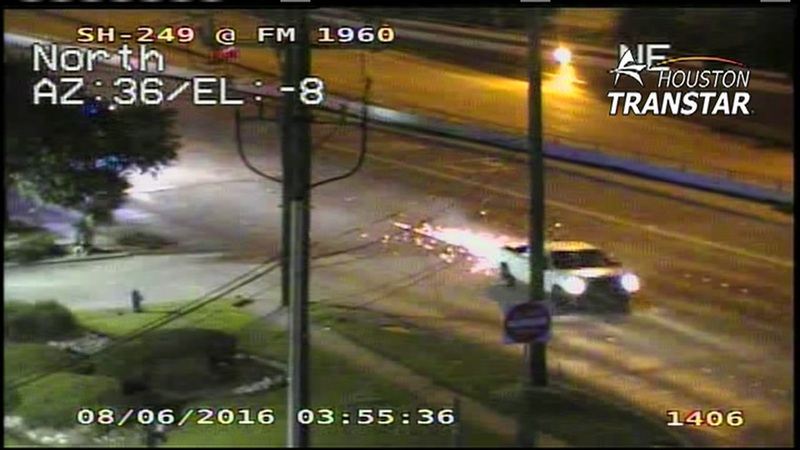 Sparks fly as police chase suspect in N. Harris Co.
HARRIS COUNTY, TX (KTRK) -- A wild police chase kept Tomball police busy overnight. And the person they were chasing is still on the run after ditching the vehicle and taking off on foot. It all unfolded in front of Houston Transtar cameras as officers chased the suspect in a pickup truck that had been reported stolen down Highway 249 and FM 1960. The chase began on FM 2920 and 2978. When police tried to stop the driver, the truck took off. At one point, sparks flew from the rims of the truck as it sped away. A high-speed chase has ended with a driver on the run in north Harris Co. The suspect was spotted again with police in hot pursuit at Highway 249 and Louetta Road. Tomball police were able to deploy a spike strip to stop the suspect's vehicle, but the suspect bailed out of the truck near the Grand Parkway and Boudreaux Road, then fled on foot into a trailer park. Police hope the sunrise will help them find him.